In this article, we propose the use of partitioning and clustering methods as an alternative to Gaussian quadrature for stochastic collocation. The key idea is to use cluster centers as the nodes for collocation. 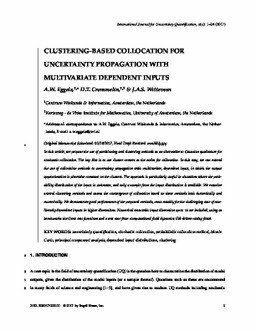 In this way, we can extend the use of collocation methods to uncertainty propagation with multivariate, dependent input, in which the output approximation is piecewise constant on the clusters. The approach is particularly useful in situations where the probability distribution of the input is unknown, and only a sample from the input distribution is available. We examine several clustering methods and assess the convergence of collocation based on these methods both theoretically and numerically. We demonstrate good performance of the proposed methods, most notably for the challenging case of nonlinearly dependent inputs in higher dimensions. Numerical tests with input dimension up to 16 are included, using as benchmarks the Genz test functions and a test case from computational fluid dynamics (lid-driven cavity flow).